Almost 20 years on from the Good Friday Agreement, Northern Ireland looks nothing like what starry-eyed dreamers may have hoped for. The rich tapestry of political life is nowhere to be seen. After the mother of all sectarian headcounts in Thursday's Westminster election, we now clearly have a two-party state. There is no point in trying to pretend otherwise. The DUP and Sinn Fein have obliterated the Ulster Unionists and the SDLP. It's impossible to see a way back for either party. For many years now they had been a shadow of their former selves. We had grown used to them hanging on in there, limping along to the end of the race. Now the death-knell has sounded. They lost their combined five seats in the House of Commons. The financial implications for both already cash-starved parties are devastating. They will lose more than £1 million in public funding over the next five years. The SDLP and the UUP are now of only regional significance with a handful of councillors and MLAs in the (mothballed) Assembly to make their case. In the wider political landscape, they are bit players. A total of 17 of our 18 MPs are DUP or Sinn Fein. And next election around, sole Independent Lady Sylvia Hermon will surely be replaced by a DUP MP. The political predominance of one party in both the unionist and nationalist communities is depressing. It's unhealthy and it's bad for democracy. Yet the UUP and the SDLP have only themselves to blame. Decades of easy success made them lazy and arrogant, so, when the going got tough, they just couldn't cope. In Thursday's election the DUP polled almost four times more votes than its rival - 36% to the UUP's 10%. DUP leader Arlene Foster along with her MPs pictured at the Stormont Hotel in south Belfast this afternoon. Photo by Kelvin Boyes / Press Eye. Press Eye - Belfast - Northern Ireland - 8th June 2017 - Westminster General Election 2017. Michelle Gildernew celebrates at the election count at Omagh Leisure Complex Omagh for West Tyrone and Fermanagh & South Tyrone. Photo by John McVitty / Press Eye. Press Eye - Belfast - Northern Ireland - 9th June 2017 - Westminster General Election 2017 The election count at Valley Leisure Centre Newtownabbey for East Antrim and South Antrim DUP's Sammy Wilson Photo by Matt Mackey / Press Eye. Press Eye - Belfast - Northern Ireland 31st May 2017 - Picture by Matt Mackey / Press Eye. Alliance party general election Manifesto launch at CIYMS in East Belfast. "Unionists saw nationalists rallying around Sinn Fein in massive numbers in March's Assembly election. 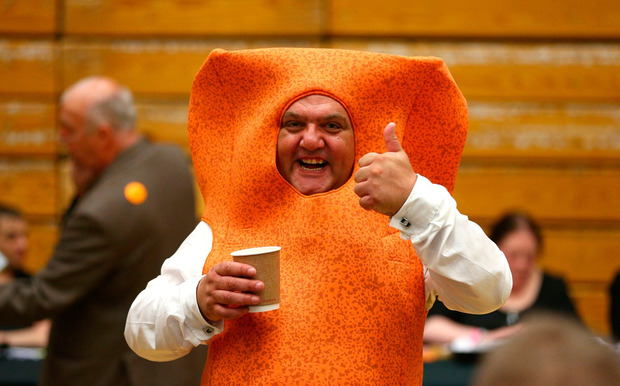 They decided they wanted a big orange attack dog to take on the big green one," a DUP source told me at the Belfast count. Over the past two months the DUP has worked tirelessly to sign up new voters. Community groups, the Orange Order and others were also involved in a unionist registration drive. Their success could be seen in turnouts of 60-70% in working-class loyalist areas where it would usually have reached no more than 30-40%. In East Belfast, which was expected to be a tight battle with Alliance, the DUP's Gavin Robinson romped home, increasing his vote by 6%. The UUP's poor performance can't be blamed on new leader Robin Swann who was only 10 days in the job when Theresa May called the election. But it's impossible to believe that he can stop the rot and get the party competitive again. In areas like South Belfast, its structures are fossilised. It lacks an energetic membership. The party just doesn't have a machine capable of fighting elections. There will surely be defections from some ambitious UUP councillors to DUP ranks. In the longer-term, a realignment of unionism seems inevitable. Sinn Fein decimated the SDLP in this election. While South Down and South Belfast looked vulnerable, few thought that Foyle, which Mark Durkan and his mentor John Hume had held since 1983, was in jeopardy. Running three former failed leaders in its Westminster seats signified the SDLP's problem. Durkan, Margaret Ritchie and Alasdair McDonnell just weren't seen as dynamic, inspiring individuals. While Sinn Fein can get away with having underwhelming MPs like Paul Maskey and Mickey Brady, the SDLP equivalent needs to be at the top of their game to compete with the republican party. Running three candidates, whose stewardship of the party had seen its continuing downward spiral was unwise. Had Claire Hanna been the SDLP candidate in South Belfast, she would have surely held the seat. The SDLP's lacklustre Westminster line-up is in stark contrast to the young, impressive team of Hanna, Colum Eastwood, Nichola Mallon and Daniel McCrossan at Stormont. Eastwood barely put a foot wrong in the campaign - and is a far superior performer to Sinn Fein's Michelle O'Neill, but it isn't enough and it never will be. The SDLP has simply passed its sell-by date. It doesn't have a credible narrative for nationalists and it is tarred with the loser tag that it will never shake off. No amount of think tanks and research studies that the party has previously commissioned can change this. During the Westminster election campaign Republic of Ireland star James McClean, Belfast boxers Paddy Barnes and Mick Conlan, and a host of GAA and other local sporting personalities lined up to support Sinn Fein, tweeting or appearing in social media videos. Nobody wanted to be associated with the SDLP. It has lost almost all connection with working-class nationalists. Young and middle-class voters also see it as less liberal than Alliance and the Greens on social issues such as abortion in cases of fatal foetal abnormality. While winning back Bobby Sands' old constituency of Fermanagh and South Tyrone was great for Sinn Fein, the real jewel was South Down. Down was historically the most anti-republican of all the Northern counties. When the GAA's Rule 21 ban on security force members was previously debated, Down alone supported lifting it. If Sinn Fein can win in that constituency, it can win anywhere. It's difficult to see the SDLP ever being competitive enough to win back the three seats it lost on Thursday; South Belfast is the only one perhaps possible. The party's only hope now is an amalgamation with Fianna Fail if that party keeps its promise to come north. Such a move could be a game-changer in nationalist politics here. While it was a great election for Sinn Fein, it was a spectacular one for the DUP. In March just 1,168 votes separated the parties - now the DUP on an unprecedented 36% has a seven point lead. Based on Thursday's results, unionists have no reason to fear a border poll. The prospects for a return to devolution appear slim. With a new Taoiseach about to be installed in Dublin, and a very shaky coalition Government in London, both parties will be tempted to do nothing until the political landscape stabilises. While Sinn Fein's more middle-class voters may be keen to get devolution up and running, the party knows that returning to Stormont and implementing Tory cuts will alienate its working-class supporters and make the likes of People Before Profit relevant again. Sinn Fein may be content to sit back and let the Tories and the DUP get on with business from Westminster, while loudly protesting at the austerity which follows. Likewise, with its kingmaking role in Parliament, and its best ever vote, Arlene Foster's party will be in no mood to rush into a deal with Sinn Fein and sign off an Irish Language Act. The two big political power blocs have never been stronger - and the growing polarisation of our communities, and stalemate at Stormont, seems depressingly inescapable. It's one of the oldest cliches in the book, but a week really is a long time in politics. Exactly seven days ago the election in Northern Ireland looked set to throw up another dose of the same old, same old. Editor's Viewpoint With just 24 hours to go to D-day for a deal to be signed between the DUP and the Tories to allow Theresa May to form a government both sides are playing coy over what is being discussed.